koi | This used to be my second life as a verb. A tale of two Kois. Yesterday I received a Well Koi pen in the mail. According to Dr. Dutcher’s listing, Well was one of the smaller pen manufacturers in Japan, and it eventually went under. This pen might have been a last gasp. 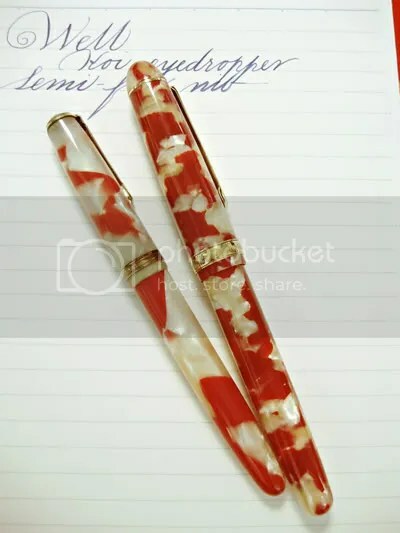 I photographed it beside a Koi pen from one of the manufacturers that survived: Platinum. The Platinum Koi is of recent manufacture, while the Well Koi is half a century old. (I’m sure you can tell which is which.) One is immediately post-war Japan, struggling to regain a position of power in the world, telling a story of past grandeur with baser materials. The other one is modern Japan, economically robust, one foot in tradition and the other in technology. And both are Koi. It seems that there are two popular symbolic meanings for Koi: nonconformity, and strength in adversity. Well might not have been saved by its pens, but I hope that even a fragment of what they meant comes through for me today. To each her own talisman.